Therefore, these types of lines can also be seen on younger people who are in the habit of frowning or raising their brows a lot. Find instructions for facial exercise for brow lines below. The first instructions for getting rid of brow lines is an exercise from the aforementioned book, “Face Lifting by Exercise” by Senta Maria Rungé. You can do this exercise either sitting down or in a standing position, though preferably in front of a mirror. You might also want to wear cotton gloves, because it gives you a much better grip. If you don’t have cotton cosmetic gloves, I’ve provided a couple of links at the bottom of this page, as you will find they are useful for quite a variety of facial exercises, as they help you get a much better anchor. Step one: Put your fingers in a row above the highest horizontal line on your brow. Rest the fingers firmly against the bone. Step two: Push the skin upwards towards your hairline as much as you possibly can. Hold the skin in this position against the bone tightly. This creates resistance for the exercise. Step three: While maintaining the resistance firmly, move your eyebrows down, without closing your eyes, then move the forehead muscles down. Slowly close your eyes tightly. Step four: Return your muscles gradually to the starting position and take your fingers away. Do this five times removing your fingers and observing the results between each rep.
Once you get more accustomed to the exercise, start doing the movements in steps. Aim to do five steps with your eyebrows, and 10 steps for the forehead muscles. Close your eyes to a count of six. Return the muscles in 10 gradual steps. 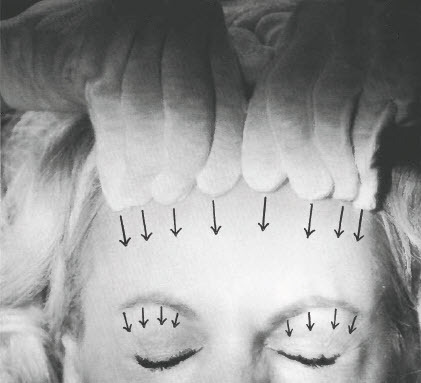 Another good Facial Exercise for Brow Lines is one by Carole Maggio from Facercise. I like this brow exercise particularly, because it can be done while driving or working on the PC. Put your thumb and index finger of one hand about an inch above your eyebrow. Push them down so your fingers are almost left on the top of your eyebrow. Raise the eyebrow as far as possible and release. Do this at least 10 times. Lastly, hold your brows up while your fingers are pushed down. Hold this position for around 20 seconds. For more information about Carole’s Facercise Program, see the link below. The YouTube video below does a very good job of demonstrating facial exercises for brow lines. Don’t be put off because the couple appear young – it could just be that they are achieving good results!